The most educational reading experience for me is a book that includes a large amount of information with which I am already familiar, illuminated by a larger amount of new information which provides new context that makes it more meaningful. If most of the information in a book is familiar already, I’m bored, and if none is familiar I’m lost. Reading Kurt Leland’s Rainbow Body, I never felt for a moment bored nor lost. The concept of the book is inspired and the author’s voice engaging. Most impressively, the research connects what for most readers are heretofore scattered and unrelated fragments of knowledge, making a coherent historical narrative that brings order to seeming chaos. The author’s website provides a chapter outline. Almost all of my experience with group meditation has involved Search for God groups sponsored by the Association for Research and Enlightenment, which use guidelines involving the Lord’s Prayer and the chakras. Familiar with the concept in Theosophical books and the Radhasoami Tradition, I had noticed some connections between the Cayce readings’ meditation technique and each of those source lineages and mentioned them in my book on Cayce in 1998. 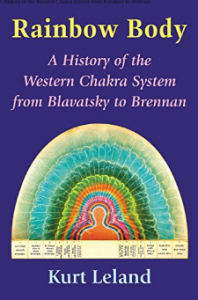 After having not given thought to the subject in two decades, I was pleased to learn of Kurt Leland’s new book about various chakra systems, which can be fairly described as exhaustively thorough. I hoped it would deliver a lot of new information that would help contextualize what I already knew, and was more than satisfied on that score. But the book delivers far more than I had hoped for, being not just a catalog of all the different teachings on chakras from various sources but a masterpiece of detective work tracing all their intricate links. This is evident throughout the book but hit home for me with Leland’s discussion of Cayce’s role in the developments he surveys. Leland notes that the Glad Helpers healing prayer group, which met from 1931 through 1944, presented various ideas and diagrams to the entranced Cayce, including a “correlation of churches with spiritual centers…identical to that in Pryse’s Apocalypse Unveiled.” Links of chakras to the endocrine glands, planets, and colors were also presented to Cayce for approval in trance. One chart approved in a reading had “correspondences between specific words of the Lord’s Prayer and the seven spiritual centers and glands. All were confirmed.” Leland notes that this derives from a diagram from the Rosicrucian Cosmo-Conception by Max Heindel which was slightly modified by Cayce after being presented to him by the Glad Helpers. These parallels are relevant to readers of Letters to the Sage for two reasons. Pryse was one of Thomas M. Johnson’s most intriguing correspondents, if not one of the more prolific, and addressed issues in his letters that foreshadow those he wrote about years later in his books. Letters to the Sage includes three letters from Pryse to Johnson, the first of which is the longest, dated November 20, 1887. Unlike most letters in the collection, this one goes into detail about occult physiology, the astral light, magnetism, and meditation techniques. Although Heindel is not mentioned in the correspondence, there is a neo-Rosicrucian subtext to the emergence of the Hermetic Brotherhood of Luxor (through literary links to Emma Hardinge Britten and Edward Bulwer-Lytton) which makes him a figure of interest to my research. He was apparently not an innovator, consolidator, or disseminator. As a medium working with spiritual contacts, he could perhaps be called a validator– which was exactly his role in relation to the lists brought to him by the Glad Helpers. The Glad Helpers themselves played the role of consolidators in their synthesis of information from Pryse and Heindel, which was innovative in its application of the endocrine glands and the chakras to the Lord’s Prayer and Revelation. The typology of innovator, consolidator, disseminator, validator used by Leland helps him trace the multiple lines of transmission of various models of the chakras from Blavatsky to the present. Although I was aware of the influence of Bhagat Singh Thind, a disseminator in Leland’s typology, on the Cayce readings, the book’s information on the influence of James Pryse and Max Heindel reveals them to be of equal or greater significance. Rainbow Body provides a felicitous combination of thorough research, engaging narrative, and illuminating explanation. It deserves to reach a wide audience of readers approaching the topic from different backgrounds.